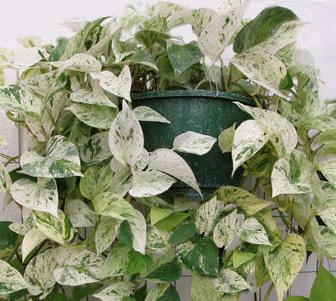 The variegated foliage of pothos can provide a colorful accent to your home. What is pothos? Pothos (also called pothos vine, golden pothos, variegated philodendron, and devil’s ivy) is a common houseplant in the Arum family (Araceae). Pothos is native to the Solomon Islands in the South Pacific. This plant was formerly known scientifically as Scindapsis aureus, but is currently classified as Epipremnum aureum. Pothos is often used as hanging plants in the home, but is a large climbing vine in its natural environment. The glossy heart-shaped leaves of pothos are often confused with those of the philodendron. Pothos leaves are mottled with yellow or white coloring, which can be so prominent that the leaves look nearly white or gold. Pothos is an easy houseplant to grow in many indoor conditions. However, it is also a poisonous plant, and therefore should be kept away from small children and pets. How do I care for pothos? Pothos should be kept in a location where it receives bright, indirect light. 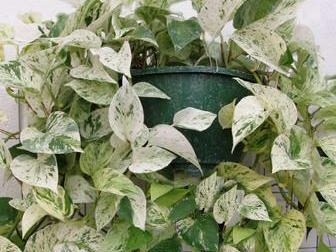 Keeping pothos under low light conditions can cause leaf variegation and color to fade. Water this plant moderately from spring to fall, allowing soil to dry slightly between waterings. The frequency of watering will depend on the size of plant, amount of light exposure, temperature and humidity of the room, and the type of pot and soil mix. DO NOT overwater pothos as this may lead to rotting stems and yellow leaves that are characteristic of a root rot problem. Pothos can be planted in a general, soilless potting mix. If you see signs of reduced growth and increased water use, the plant may need to be repotted. Repot in spring if needed, and use a container that is one size larger or no more than two inches in diameter wider than the current pot. During active growth, apply a weak liquid fertilizer once every one to two months. Trim back long shoots regularly to keep the plant compact and bushy. Also carefully remove any rotted or dead stems, or spotted leaves if they occur. Pothos will grow more vigorously when leaves are cleaned and misted periodically. Put pothos plants in the sink or shower and run lukewarm water over them to wash the leaves. Make sure the pot has adequate drainage to prevent soil from saturating. These regular treatments can also help prevent insect pest problems such as mites and mealybugs. If mealybugs become a problem, a damp cloth or rubbing alcohol can be used to remove them. Continue treatment until insects are gone.